The mouse class inherits both QObject and QGraphicsItem. The QGraphicsItem class is the base class for all graphical items in the Graphics View framework, and provides a light-weight foundation for writing your own custom items. When writing a custom graphics item, you must implement QGraphicsItem's two pure virtual public functions: boundingRect(), which returns an estimate of the area painted by the item, and paint(), which implements the actual painting. In addition, we reimplement the shape() function to return an accurate shape of our mouse item; the default implementation simply returns the item's bounding rectangle. The rationale for deriving from QObject in addition to QGraphicsItem is to be able to animate our items by reimplementing QObject's timerEvent() function and use QObject::startTimer() to generate timer events. Then we call the rotate() function inherited from QGraphicsItem. Items live in their own local coordinate system. Their coordinates are usually centered around (0, 0), and this is also the center for all transformations. By calling the item's rotate() function we alter the direction in which the mouse will start moving. 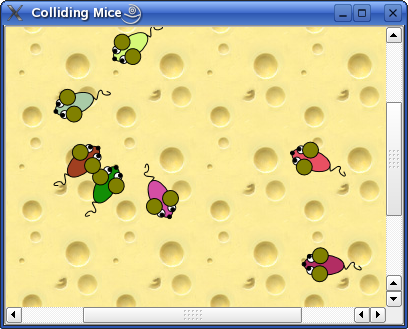 First we ensure that the mice stays within a circle with a radius of 150 pixels.